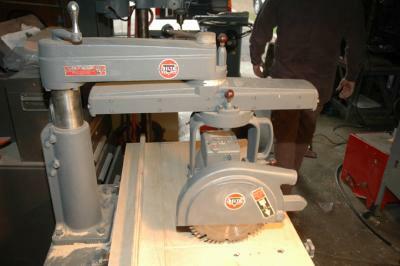 Advertised as a "10" Portable Radial Arm Saw," I'm certain it was too heavy to move much. This was provided by Delta as a “cost-cutting” Saw identified as Model 30C. It was powered by a 1 1/2 HP motor that developed up to 3 HP under load and was provided with and without a stand. does anyone have a manual? I have a 30C that I got in trade for some work. Wondering if anyone has a manual or info? Nice saw! Is there some locking mechanism for the vertical adjustment? The vertical adjustment crank on my recently acquired Delta Rockwell 30C 10" radial arm saw wasn't moving but a quarter turn until we tried so hard that the spring pin broke. Any advice? Thanks in advance! Return to Tool Photos & Information.